Definition at line 34 of file MCSubtargetInfo.h. Definition at line 41 of file MCSubtargetInfo.h. Definition at line 46 of file MCSubtargetInfo.h. Definition at line 36 of file MCSubtargetInfo.h. 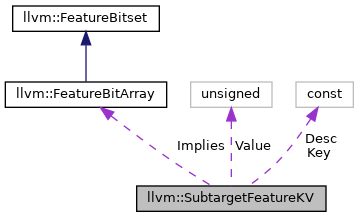 Definition at line 38 of file MCSubtargetInfo.h. Definition at line 35 of file MCSubtargetInfo.h. Definition at line 37 of file MCSubtargetInfo.h.